Taco Bell brings back the Triple Double Crunchwrap, the meatier, cheesier version of the Crunchwrap Supreme, for a limited time. The menu item features two layers of seasoned beef, two layers of nacho cheese sauce and two crunchy tostada shells (hence the "triple double"), lettuce, reduced-fat sour cream, and tomatoes wrapped up and grilled in a flour tortilla. You can pick one up for $3.49. A spicy version that includes jalapenos and spicy ranch sauce is also available for the same price. There's also a "Big Box" combo that consists of a regular or spicy Triple Double Crunchwrap, a Doritos Locos Taco, a crunchy taco, and a medium drink for $5. 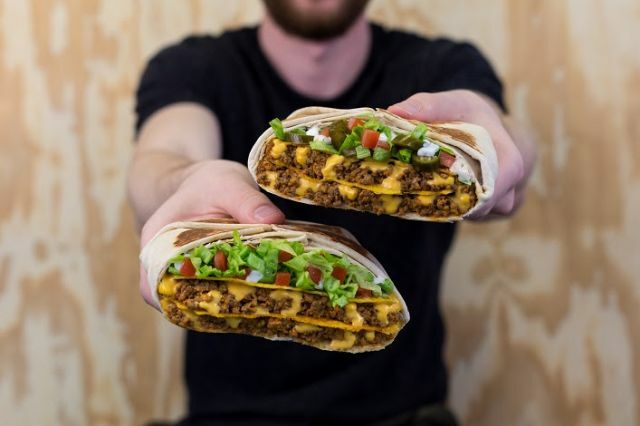 Look for the Triple Double Crunchwrap to stick around for about five weeks which is the standard length for Taco Bell's limited-time menu items. You can find my review of the Triple Double Crunchwrap here.